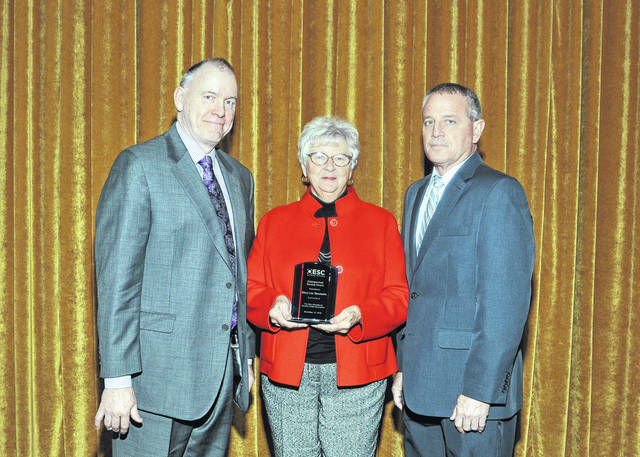 Mary Lee Gecowets, center, received the Ohio ESC Distinguished Service Award for her 20 years of service on the the board of the Madison-Champaign ESC. She has been on the board since 1998, serving as its president for the last 12 years. Shown with her are Dr. Dan Kaffenbarger, left, Madison-Champaign ESC superintendent, and Rick Edwards, OESCA president. 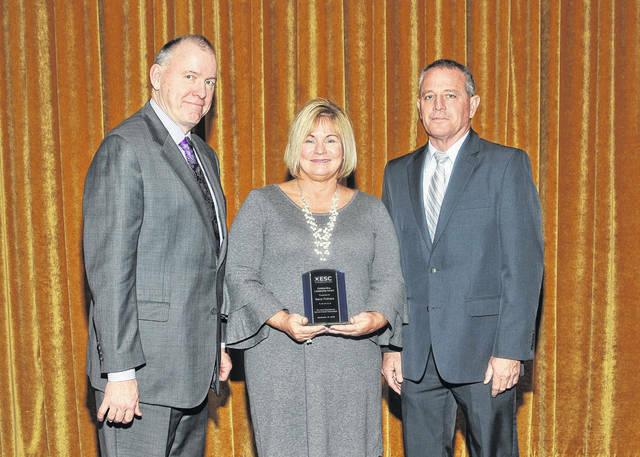 Kerry Pedraza, center, received the Ohio ESC Community Spirit Award for her work as executive director of the Clark, Champaign and Madison County United Way. She has increased the visibility of United Way in all three counties during her tenure. Her focus on early childhood literacy has resonated with the school districts in her three-county service area. Shown with her are Dr. Dan Kaffenbarger, left, Madison-Champaign ESC superintendent, and Rick Edwards, OESCA president.